Killer Characters: Put Your Party Hats and Dancing Shoes On! Put Your Party Hats and Dancing Shoes On! Hi, it’s Kath Rutledge - greetings from Blue Plum, Tennessee. Ardis Buchanan, Mel Gresham, Ernestine O’Dell, Joe Dunbar, and Thea Green are here, too. (And Geneva the ghost!) Everybody wave! Okay, that’s great. 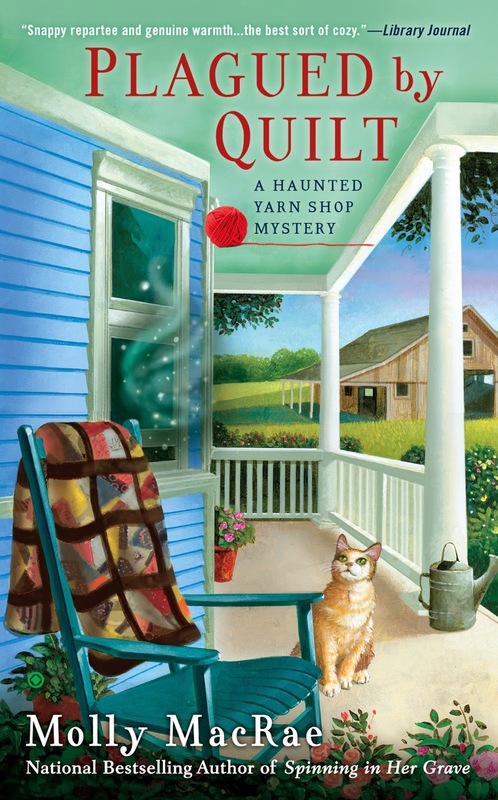 We’re all excited because our next book – our fourth book – Plagued by Quilt – comes out in a little more than a week, and when you read it, you are in for some fun. You don’t have to take our word for it, though. Thea, our town librarian gets Library Journal and she found a review of the book. Here are our favorite lines from the review: “The fourth entry (after Spinning in Her Grave) in MacRae’s series is full of loving crafting details and quirky, sassy characters. If you like mysteries about life in a small town, this is the series for you.” Isn’t that the nicest thing to hear? Now, it’s possible the Spivey twins will show up any minute, so before they do, we wanted to let you all know about two Facebook parties coming up where you can meet our author and some of her friends (including Diane Vallere, author of Suede to Rest, the first book in the new Material Witness Mysteries), play games, listen to music, exchange recipes, and win prizes. Both parties are the evening of Tuesday, November 4th. One is celebrating the release of our book, Plagued by Quilt, and Diane Vallere’s Suede to Rest. It’s from 6:00 p.m. to 10:00 p.m. eastern time. The second party is a holiday recipe exchange from 7:30 p.m. to 9:30 p.m. eastern time, and features authors Amy Alessio, Mel Jolly, Sarah M. Anderson, Anne Ylvisaker, Susan Miura, and our author Molly MacRae. Molly’s going to be a little busy that night, so you might want to stop by just to see if she maintains her sanity! How do you get to the parties? Click the party invitations and you'll be whisked over to the Facebook pages like magic. We hope to see you the night of the 4th, and we hope to see you soon in the pages of Plagued by Quilt! Going to find my dancing shoes, party hat, and stretchy waist dress pants. No doubt about it, Melissa. We'll have party favors for everyone, music, games, prizes, refreshments, pop quizzes (but not scary ones), and more! Polyester Monroe is looking forward to it! Congrats on a wonderful launch party!!! I'm proud to know 'ye. Congrats on a wonderful launch party!! I'm proud to know 'ye.